You'll be coming back for more with this delicious take on fried-rice. In the same large, non-stick frying pan, heat half the oil over high heat. Cook beef, in 2 batches, for 1-2 minutes or until browned and tender. Set aside on a plate covered with foil. You can slice rump, scotch fillet, sirloin or fillet of beef to make your own stir-fry strips. Swap asparagus and sugar snaps for snow peas and Asian greens. Thinking of trying something new this week? 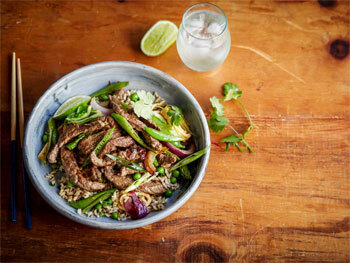 Why not give a delicious Asian inspired beef bowl a go. Building a fresh and healthy bowl is easier than it looks, so try these five recipes for the perfect balance of protein, good carbs and fresh vegetables. With 70% of Aussies changing their diets between seasons, now is the perfect time to move away from those heavy winter dishes to a healthy alternative. As a great source of lean protein, Australian Beef is the perfect option. These tasty recipes each feature quick cook cuts like beef mince, rump steak or beef strips, which all take less than 10 minutes to get melt-in-the mouth beef every time. From a spicy Korean beef salad to Japanese glazed meatballs, these dishes not only taste amazing but are full of nutrients which help you feel energised and motivated. For additional recipe inspiration, visit www.australianbeef.com.au.